Stockholm University and NORDITA host this week an international workshop on axions and dark matter. Axions are hypothetical particles proposed by Frank Wilczek who has started an appointment at Stockholm University. 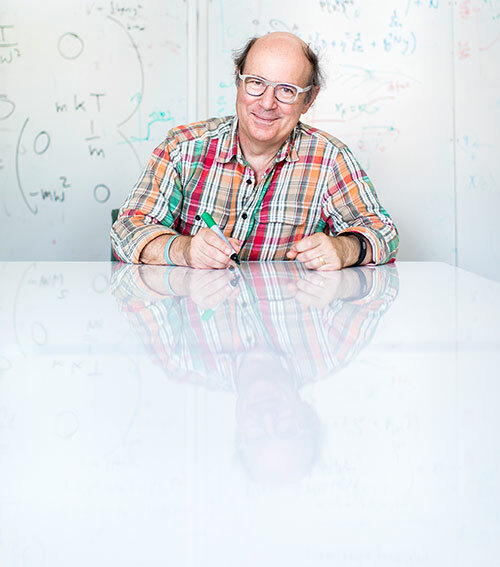 Dr. Frank Wilczek shared the Nobel prize in 2004 for discovering the equations that describe the strong force which is responsible for holding atomic nuclei together. With a generous grant from the Swedish Research Council he now has a joint appointment at Stockholm University and the Massachusetts Institute of Technology (MIT). Throughout his career Dr. Wilczek has worked on a number of different problems in condensed matter physics, astrophysics, and particle physics, including proposing new particles. Axions are hypothetical particles invented in the late 1970s to solve a major blemish of the standard model of particle physics, namely its failure to explain why the fundamental laws of physics look almost the same if you run time backwards. To address this issue Roberto Peccei and Helen Quinn postulated a new kind of symmetry, now called Peccei-Quinn (PQ) symmetry. Frank Wilczek and Steven Weinberg independently realized a key consequence of PQ symmetry, which its authors had overlooked: it implies the existence of a new particle that Wilczek named the axion, after a laundry detergent (since it removes a stain). If axions exist, they will not only solve a big problem in fundamental physics – they are also likely to supply the mysterious ‘dark matter’ observed by astronomers. In recent years axions have inspired many new theoretical investigations, recorded in thousands of papers. Importantly, now the stage seems set for breakthroughs on the experimental front. Stockholm University and NORDITA (The Nordic Institute for Theoretical Physics) are hosting an international axion dark matter workshop in Stockholm, December 5-9, bringing together leading researchers in the field. Frank Wilczek is among the organizers of the workshop. Here is the film of Frank Wilczek’s colloquium given on November 24, 2016 at Fysikum, Albanova, to celebrate his installation as professor at Stockholm University. “Augmenting Reality: Axions, Anyons, and Entangled Histories”.